On August 24, the wedding of the 21-year-old model Tina Kunakey and 51-year-old actor Vincent Cassel took place in Biarritz, but the celebrations do not seem to be over. Young beauty continues to rest on the picturesque ocean shore near Biarritz. She showed off new pictures taken the day after the wedding. On them Tina is seen posing on the beach, whirling in a white dress from Attico with a scent and a wide straw hat from Jaсquemus. But models used to show several outfits at once, so Kunakey appeared in front of the camera in an exciting dress, changing into a seductive white swimsuit with a micro-skirt from Sama Danesh. Although Kunakey is now also a legitimate spouse, she is not yet going to leave the image of the bride. For rest Tina persistently chooses snow-white outfits. In a dress with a deep neckline and sleeves from the same brand Kunakey went to a boat trip on a yacht, where she was spotted with the swimmer Florent Manaudou. On the eve of the wedding Kunakey and Cassel gathered friends at the fashionable hotel Hôtel du Palais. In the luxurious interiors of the former imperial palace, the bride managed to arrange a comic photo session with actress Adel Excarcupoulos. Tina Kunakey in a short dress with ruffles and lace and Adele in a pink and white checkered set of skirts and croche-top from Les Prêteuses had fun before the camera. 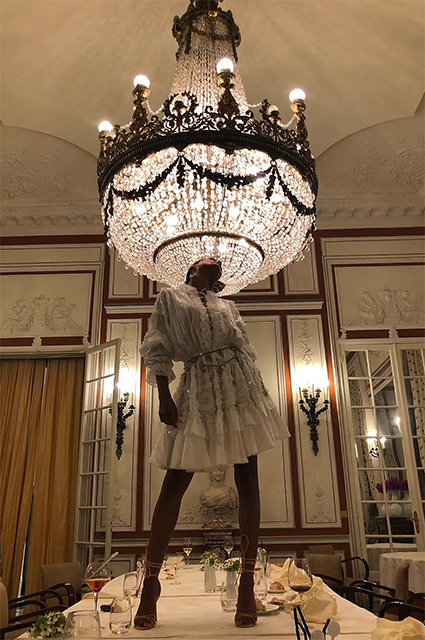 However, Tina did not forget about the spectacular pictures for Instagram - to pose against the background of a massive crystal chandelier, Kunakey even climbed onto the table.